These Small Island Towns: Bucket List Musts! Many folks we’ve talked to over the years have raved about island towns they think are THE best in America. South Padre (TX), Key West (FL), Mackinac (MI), Nantucket (MA), Mount Desert (ME), and Catalina (CA) are several. We’ve been to a few of these special places and they’re absolutely beautiful. The Discover Small Town America Tour recently went to another fabulous island that, for our money, on that day, was definitely a Top 10 of the best islands towns in the U.S. The place? Martha’s Vineyard, MA (pop. 16,600), which is located off the southern coast of Cape Cod. The Weather? Postcard perfect, with azure blue skies, not a cloud to be seen and a gentle breeze. 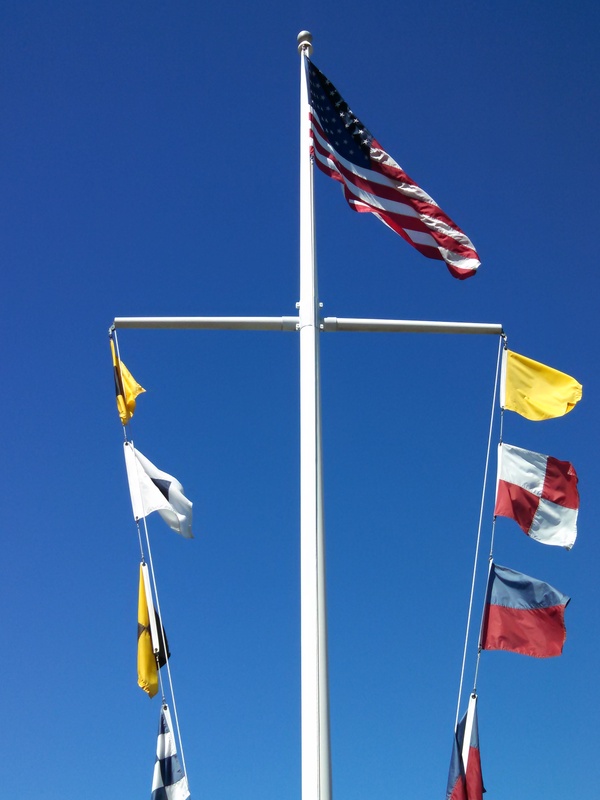 Above is a shot of the flag and pennants blowing gently at the dock. 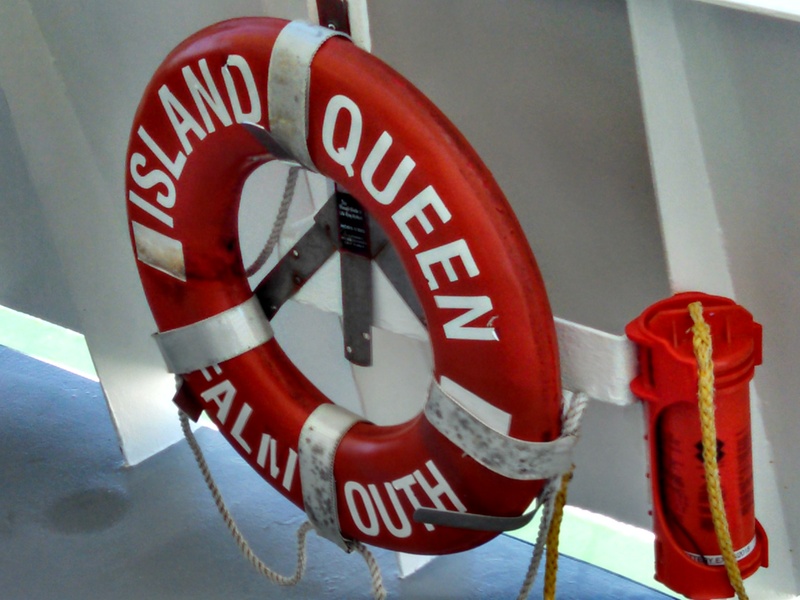 This is the Island Queen arriving in Falmouth. Bart made sure there was protection onboard for Rorie. 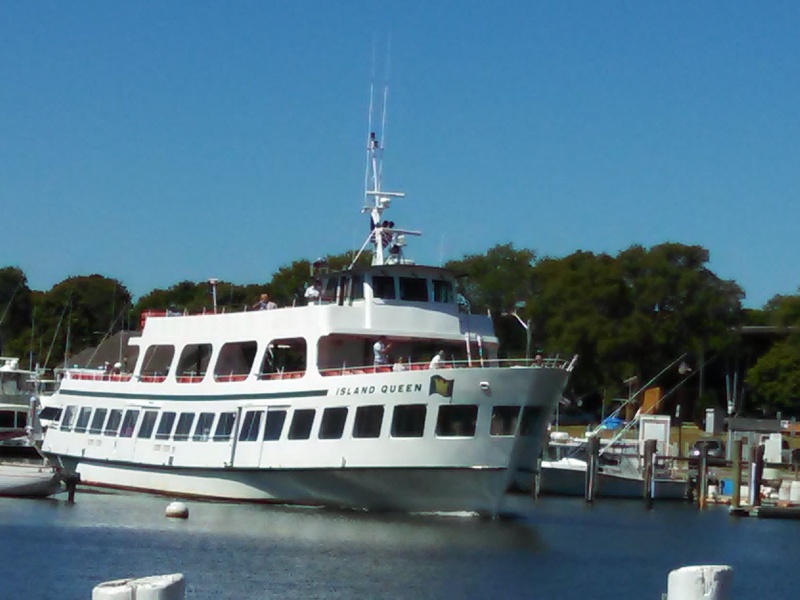 Martha’s Vineyard consists of 6 small towns, all beautiful and all with a unique look and feel. On this trip, we explored Edgartown (pop. 3,779) and Oak Bluffs (pop. 3,713). 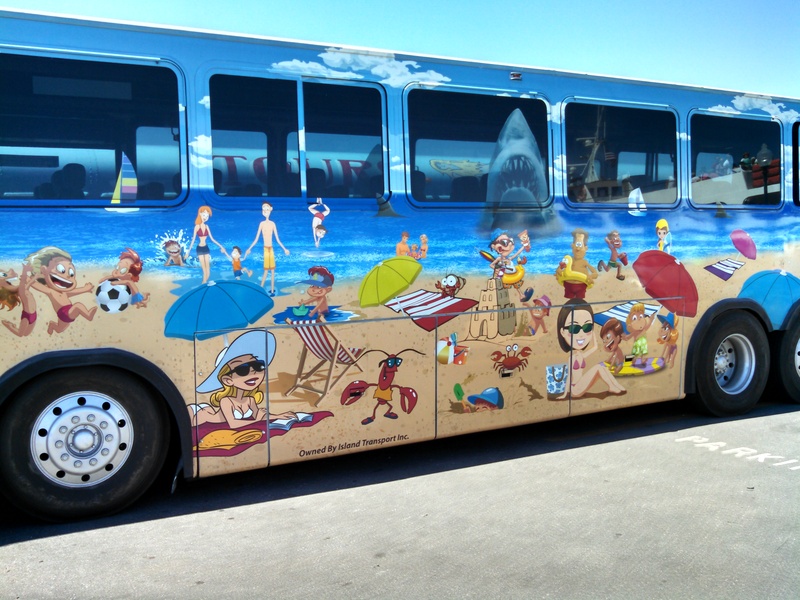 When we arrived at the dock in Oak Bluffs we saw this colorful tour bus waiting to help newcomers around the island. Did you notice the image in the 3rd window from the left? Can you say “Jaws”? For those who may not know, the famous – and scary – shark scene at the beach in this Steven Spielberg classic was filmed on the Vineyard (called Amity Island in the movie). 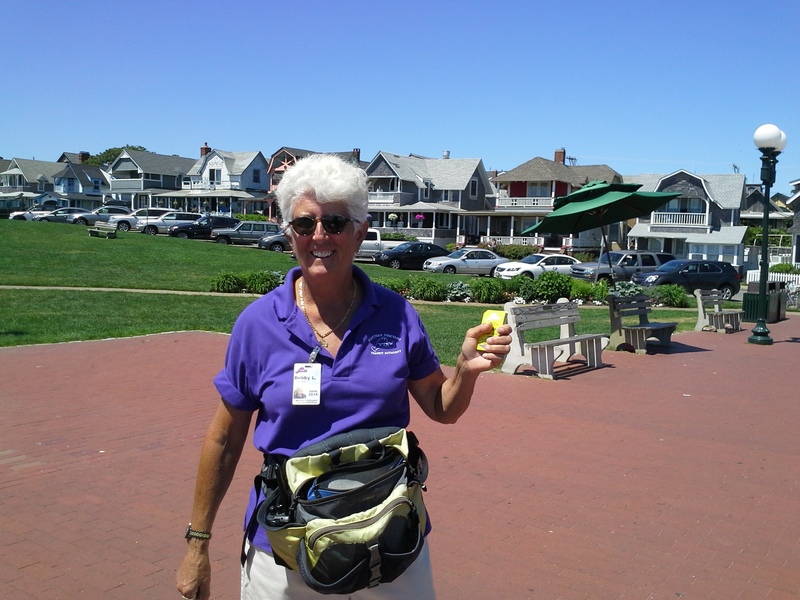 Rorie and Bart took a public bus (MV Transit) to Edgartown. We bought tickets on the main road adjacent to Ocean Park from this wonderfully friendly woman with the big smile. …Daniel Day-Lewis, Christine Baranski, Michael J. Fox, and Dustin Hoffman (well, maybe not with them but where they live in picturesque Litchfield County). 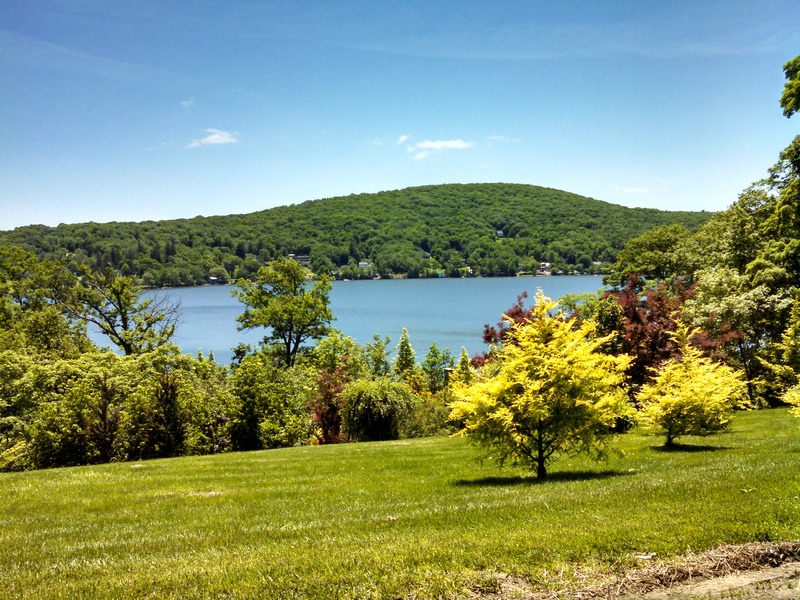 Back in their old stomping grounds, your DSTA proprietors recently took advantage of a beautiful sunny day to rediscover some small town gems in Northwest Connecticut and the surrounding environs. 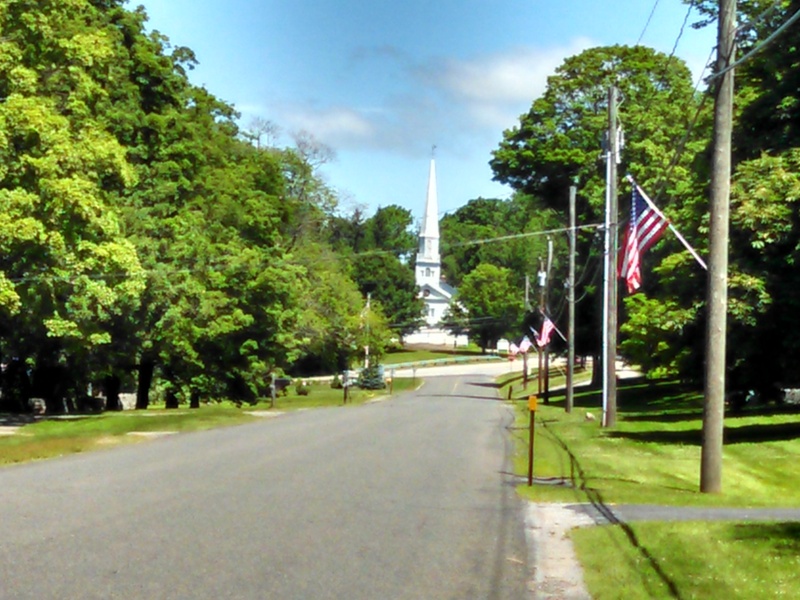 The Tour began on back roads in the town of Farmington and continued on to Harwinton (pop. 5,200). Harwinton is a wonderful rural community with a historical district consisting of typical New England frame homes and a school dating from the 18th century. Reluctantly skipping the pancake breakfast being held at the Harwinton Fire House, we continued our journey through scenic northwest Connecticut. Rorie would like everyone to know she bypassed the Litchfield Candy Company, although it was calling her like a siren calls sailors to the rocks! She did note that the huge Weight Watchers meeting sign across the street from the candy store probably influenced her decision. Moving on, we headed to New Preston (pop. 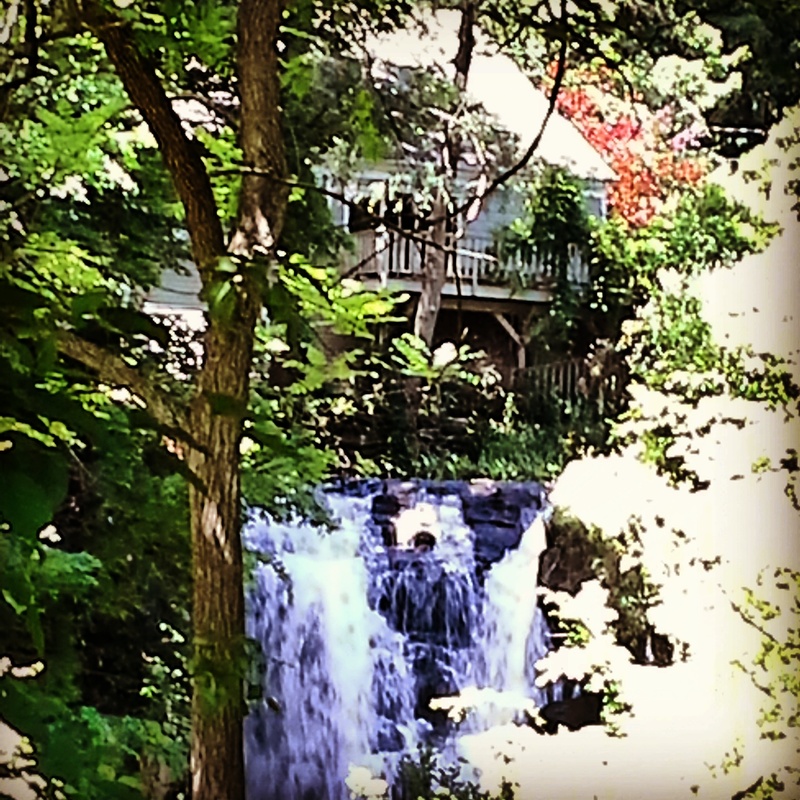 1,100) where the sound of rushing water and a spectacular waterfall greeted us. The Aspetuck River runs right through the center of the village and provides a dramatic backdrop to the high-end shops, antique stores and restaurants lining both sides of the street. 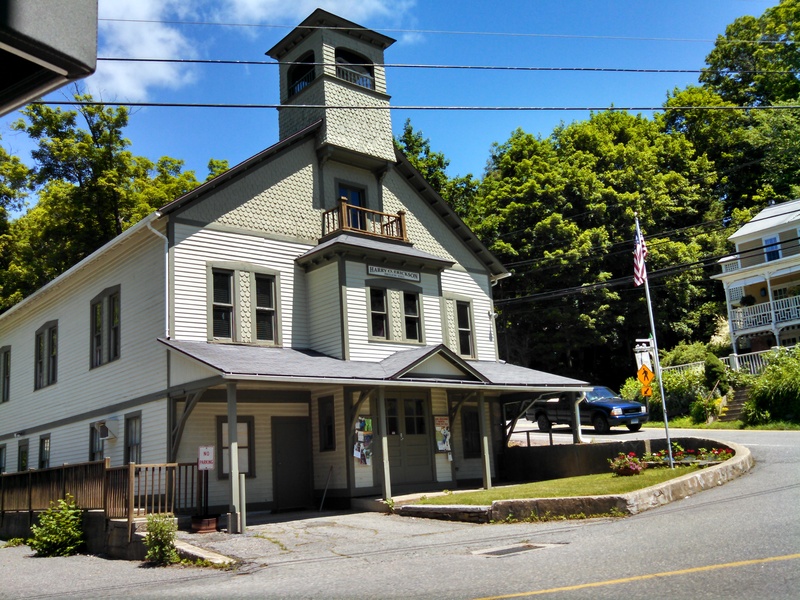 This is the Harry Erickson Pavilion (named after a beloved community volunteer) which was built in 1897 as a community hall and once housed a post office. Today it serves as home to the Boys and Girls Club of New Preston. 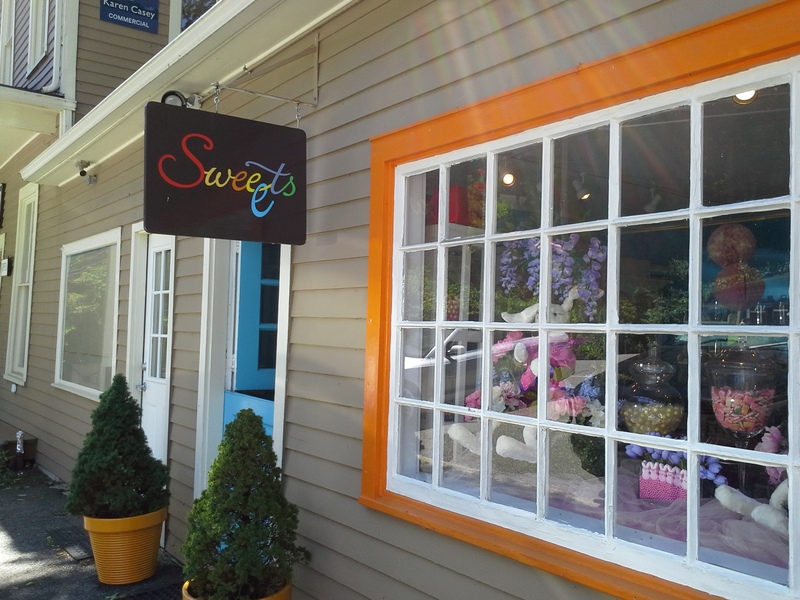 Rorie wanted it to be known that, once again, she remained strong and ignored her inner sweet tooth as we walked past the aptly named candy store “Sweets”. Right outside of the village is Lake Waramaug, named after the chief of the Wyantenock tribe. The lake occupies parts of the towns of Kent, Warren and Washington, and is ringed by gorgeous summer cottages, boathouses and mansions. After driving around the entire lake, we stopped at the well-known Hopkins Vineyard Winery, which has been owned by the Hopkins family for over 225 years. The winery’s tasting room and wine bar offer samples of its award-winning “grape nectars”. Across the street is the Hopkins Inn, a lovely 19th century B&B and restaurant. Both places sit above the lake and provide spectacular views. 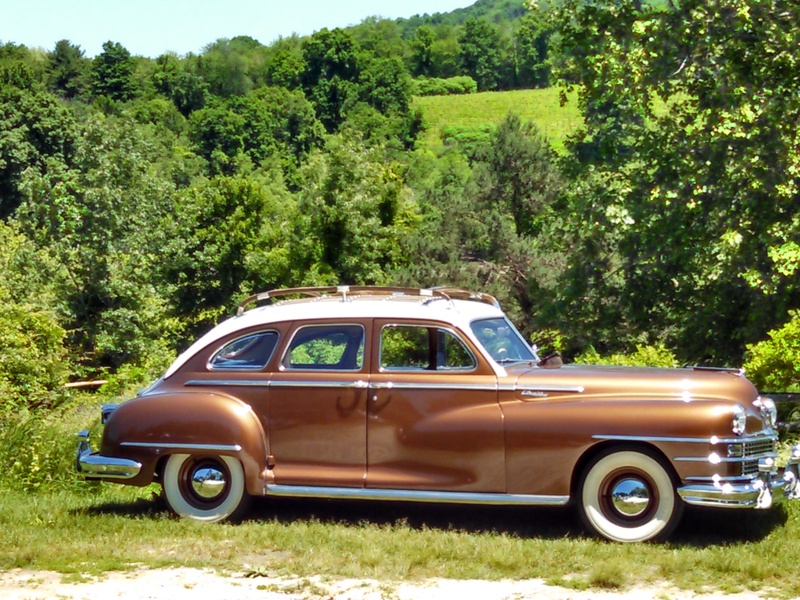 Although there was beauty everywhere, and our heads were swiveling from side to side to take it all in, it was this vintage 50s Chrysler Traveler in the parking lot of the Inn that really got our attention.